The country’s largest food and drink event opened its doors in London to food enthusiasts this weekend with thousands of products on display across two jam-packed halls. The 20th edition of the International Food and Drink Event (IFE) attracted global buyers and suppliers to the ExCel with a huge range of new and exciting products on display, as well as industry experts who shared their invaluable insights on current issues and future trends. While the opening day attracted a steady stream of Sunday visitors, numbers certainly picked up yesterday with 30,000 attendees from 108 countries expected over the course of the four day event. And with over 40 Halal stalls spread across two halls holding around 1,350 exhibitors, IFE was a melting pot of cultural smells, flavours and cuisines. While Turkey had the largest representation, there was also a company from China that was hoping to find distributors for its voluminous supply of Halal chicken. Import & Export Executive, Charles of the Qingdao Nine-Alliance Group said that Brexit had forced the company to send representatives for the first time to the UK for business purposes. 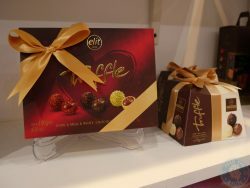 One Turkish company, which had been established since 1924, offered luxury chocolates including a variety of truffles presented in elegant bow-tied boxes. There were also a number of companies specialising in dates particularly from Palestine with one representative from the region claiming to cultivate only “real Palestinian dates”. With almost every stall offering some sample of its produce, visitors could easily snack on the tantilising range of food and drinks without having to worry about lunch. From well established global enterprises to new startups, IFE was an opportunity for both seasoned punters as well as the neophytes. There was one startup company dealing in health salts which had only been going for three months, but claimed to have made over £80,000 during that period. Successful Halal businesses also well represented a post-Brexit Britain. 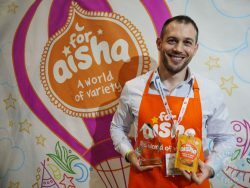 Baby food specialist, for Aisha, whose meat and non-meat products are on the shelves of some of the country’s leading superstores, was ideally situated near the entrance of the Great British and Irish Food hall. Founder, Mark Salter, who was not shy in proudly displaying his winning trophy for The Grocer’s New Product Award 2016, said the company had big plans for 2017 including an eye for going international. Long time Bradford Halal restaurant, Mumtaz, had a cooking hob set up at its stall with the aroma of fresh samosas and pakoras filling the air throughout the day. For entertainment, there were live cooking shows taking place right throughout the day. Although a number of celebrity chefs were invited to show off their culinary talents, no Muslim chefs were on show. If you want to contribute to the UK’s most popular Halal food news website, contact FtL’s Editor, Hamza A. Bajwa, now!